Since this is the second book in a series, there need to be spoilers for the first book, The Fifth Season. For one thing, Damaya and Syenite are names that Essun used during different periods in her life, so the three stories are really all one story. I didn't talk much about the plot of that book, but it begins with a huge rift in the Earth that is bringing on a Fifth Season. 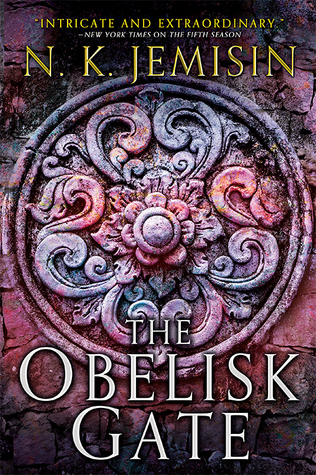 At the very end, Essun is reunited with Alabaster, who is slowly turning to stone, and he asks her if she's able to call the obelisks to herself yet, and if she's ever heard of a moon. 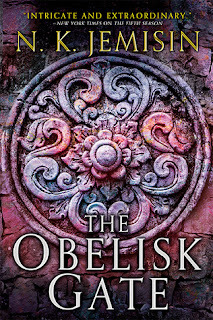 The Obelisk Gate picks up during this same conversation, and Alabaster explains that she needs to find out if she can control the obelisks, and it's very important and related to the moon. The book moves back and forth between Essun's story and that of her 8-year-old daughter Nassun, who disappeared along with her father at the beginning of The Fifth Season. Nassun has pretty powerful powers of her own and her relationship with her father is strained at best. He's taking her to a place he's heard of where they may be able to "cure" her, but that's not what this place turns out to be all about. Nassun meets her mother's old Guardian, Schaffa, though she does not know that he knew her mother. Schaffa has changed since those days and he and Nassun work together to train her and she continues to discover new ways her powers work. There were some very cool things in this story, such as a whole community that lives inside a geode. I kind of hope this is made into a movie someday so I can see it because it sounds spectacular. Plus everything involving the obelisks was kind of cool, though I admit I'm still a little unsure about the role they play - we see ways in which they are used, but I'm wondering how they will relate to the larger picture. I also liked everything about the stone eaters - I have a hard time not picturing them like the weeping angels from Doctor Who, but I find them so delightfully creepy. In a way, I think this books suffers a little from being the second book in that I didn't feel like the plot was furthered as much as I would like, but there was a lot going on and many new elements introduced, so I ended up liking it as much as the first. Last weekend I decided to grab The Stone Sky from the library when I went into work on Monday, but I ended up being out sick and someone else got our copy before I returned. I requested a copy from another library and was afraid I wouldn't get it before this long weekend. But I got it just in time, which is great because I need to start on it immediately! I'm really, really looking forward to seeing where this story goes in the final book!